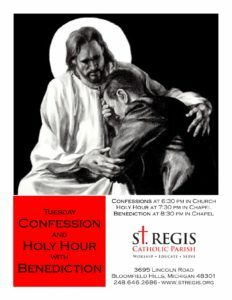 Tuesday Confessions: Every Tuesday evening 6:30 -7:30 p.m. in the Church. One or more priests will be available. Tuesday Holy Hour: Every Tuesday evening 7:30 -8:30 p.m. in the chapel. Adoration, song, quiet prayer, intercession, ending with Benediction service.